There are always fan-produced Star Trek projects floating around. There have been since the original series, actually. I feel like right now, we’re living in Peak Trek, what with Star Trek Continues (which I’ve done several write-ups on for the O-Deck), Axanar, Star Trek: of Gods and Men, and Star Trek Phase II. Heck, that’s only the video side of things. Giant Gnome productions brings us the ongoing audio series Star Trek: Outpost, while a quick search for fan fiction unearths not only a few hundred thousand tales floating around the digital aether, but also a couple of entire roleplaying forums dedicated to real-time, living Star Trek adventures. That’s not even counting the online communities centered around the popular MMORPG, either. Peak Trek, indeed. Gene Roddenberry himself once famously stated that there was no higher honor than to have a fan work created to continue the work you started. 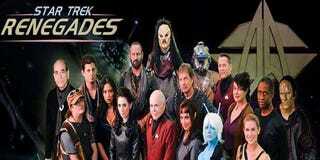 It was with great joy that I signed into YouTube tonight and saw that Star Trek Renegades had been released after nearly two years in development! This is no small-time show filmed in a basement. This is the real deal; ten minutes in, you’ll forget that you’re watching something fan-made and you’ll swear up and down that you fell into a mirror universe where this is an official movie. The plot? An alien race has a mega-weapon that they’re wiping entire planets out with. The only people who can do anything about it are Admiral Pavel Chekov and Tuvok... but they’ll need help from outside the Federation, as numerous attempts on Chekov’s life show there to be wheels within wheels turning against our heroes. Enter the Star Trek equivalent of the Suicide Squad: rebels, scoundrels on the run from the law, they’re the perfect expendable crew for this mission... if they don’t kill each other in the process, that is. Never turn your back on a Breen, man. Technically, the film has some stunning effects and gorgeous scenery. The budget was well spent on the panning shots over future San Francisco and the space battles. Unfortunately, the script is hit or miss, uneven in places. If this were a backdoor pilot to an ongoing series, it would work better, but as a self contained movie, there’s just too much going on, too many important plot threads that are never fully explored or explained to make this a truly great work of art. I love the idea of the Renegades galivanting around space after the end of the film, if only so that maybe some important questions could be asked. If anything, the writers, cast and crew have created a memorable one-off that has left me curious and drawn some serious parallels between this and Gene Roddenberry’s other great work, Andromeda, with its cast of misfits. No, not Earth: Final Conflict. That was a terrible show and you’re terrible for liking it. The cast is great, with veteran Trek actors and appearances from some of science fiction film and TV’s most notable roles, including Edward Furlong, Grant Imahara, Sean Young, Gary Graham, Robert Picardo, and even Corin “I’m not Daniel Jackson” Nemec. There are also some great appearances that further the existing mythos, such as Manu Intiraymi returning as the rescued Borg, Icheb. What are you waiting for? Set phasers to full screen and beam down some popcorn!